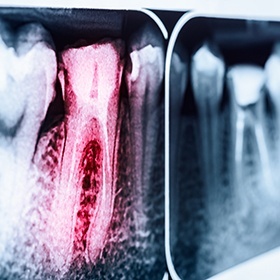 If you have a toothache, you may need a root canal treatment. Though root canals tend to have a bad reputation, people who've had the procedure can tell you it is not nearly as painful as many people are led to believe. In fact, it is about the same amount of discomfort as having a cavity filled. However, we are not insensitive to patients with dental phobias. If you are nervous, be assured you will be well cared for. We even offer nitrous oxide gas if you'd rather be sedated during the procedure. You can learn more on our technology page. Your body has a marvelous way of dealing with infections. As soon as an infection is detected, your white blood cells and antibodies go to work and attempt to eliminate the infection. However, with tooth infections, there is a complication. The area inside the tooth is a confined space. As the tissue tries to swell, there is no extra room, so it usually dies. At this point, the pain may go away and you may think that the problem has solved itself. Unfortunately, it hasn't. Instead, it has begun to move into the bone. This is how you get an abscess, which calls for a root canal. In a root canal treatment, we'll first remove the dead or diseased tissue. We'll then thoroughly clean the inside of the tooth and place a sealer material inside it. It's important that the tooth is filled to the very end of the apex of the root. It is likely that the tooth is so weakened at this point that it may be wise to place a crown on it as well. Pain when biting on a tooth. A pimple on your gums that releases pus or blood. Radiating spontaneous pain from a tooth. If you suspect that you may need a root canal, you can call our office to make an appointment. If you prefer, you can also click here to request an appointment online.